Consult PR Management, Doing Great Things! When they’re not helping you to create, market and expand your web presence, our leaders are up to some really great things. 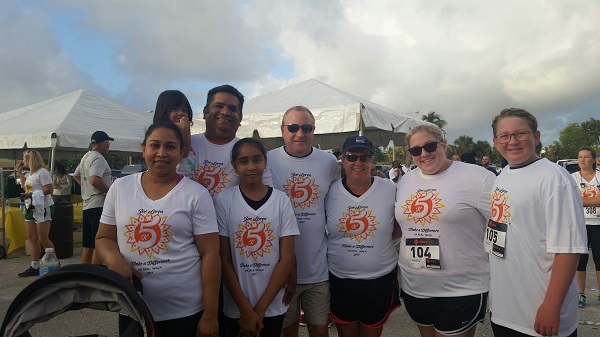 Just last weekend, one of our clients, the Zoe Loren ‘Make a Difference’ Foundation, held its seventh annual 5K Run/Walk fundraising activity. To show our solidarity to the organization and its cause, our main principals were in attendance and provided full support. Consult PR President Paul Ramkissoon and CEO David Blotnick attended the activity, families in tow. Additionally, we are proud to announce that our CEO David Blotnick was recently voted as a Board Director for the International Executives Association (IEA). David took up the post as CEO in September (2017) after serving as our COO for two years. David has over 25 years of top-level managerial experience, and his experience, leadership skills and aptitude for innovation make him a force to be reckoned with. Before his appointment as Board Director, David served as a member of the IEA’s Marketing committee. There are over a hundred official Executives Associations (EA) across the globe. The International Executives Association (IEA) is the overarching body that unites these various Executives Associations. The first Executives Association began in 1916 in San Francisco with the purpose of creating an elite business networking organization to share confidential business leads and information among member firms. Since then, EA’s across the globe have been working to connect business in all sorts of industries to one another, providing an atmosphere for mutual sharing and benefit. The IEA works to bring all of these separate EA’s together, through outreach activities as well as its annual Conference. Our CEO, David Blotnick, has expressed his intention to use his experience in the business arena to make the IEA an even stronger body. He is excited to continue his work with them to strengthen and foster new relationships between EA’s from across the globe. Consult PR is proud of our CEO! We know that he will make a lasting impact in his capacity as Board Director for the IEA. Congratulations David!